If you’re searching for used desks for your home or business in Sandy Springs, Duluth, or any other nearby area in Georgia, turn to NorthPoint Office Furniture. We carry a wide selection of gently used desks from the industry’s most trusted manufacturers, such as HON, DMI, Global, Martin Home Furniture, and Cherryman Industries. You can view all of the high-quality office furniture we offer at our beautiful showroom in Roswell, where we encourage you to see the exceptional condition of all of our previously owned furniture items and test them out for yourself. Whether you’re looking to upgrade to a bigger desk or you want to totally revamp the look of your workspace, NorthPoint Office Furniture will help you find the products you need. 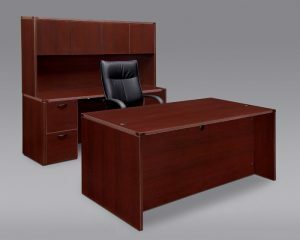 In addition to used desks, NorthPoint Office Furniture offers an impressive inventory of other previously loved furniture items, including office chairs, filing cabinets, credenzas, hutches, conference room furniture, and virtually anything else you may need for your office. No matter what your requirements are for furnishing your office and business, you can count on our knowledge and expertise to guide you to the products you want and need. To learn more about our inventory of used desks and other gently used furniture items, contact us or stop by our showroom today. It is our pleasure to serve businesses in Sandy Springs, Duluth, and all other surrounding communities in Georgia.